Fox and his ragtag team of Diggers are back for another action-packed season of footy, fun and friendship in Fox Swift and the Golden Boot. 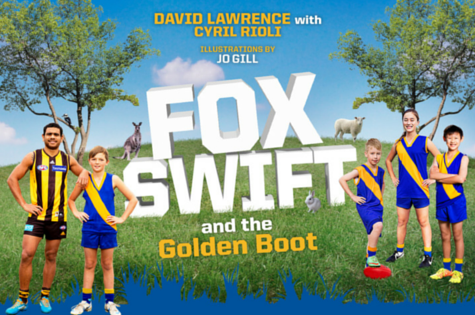 The third book in the hilarious football series by David Lawrence with Hawthorn superstar Cyril Rioli and comedic illustrator Jo Gill, Fox Swift and the Golden Boot is a thrilling page-turner that will keep even the most reluctant reader entertained from start to finish. This year Fox visits the Tiwi Islands with his best mate Lewis Rioli, he plays a thrilling game with the locals, is nearly trampled by a water buffalo, and has a close encounter with an extremely hungry crocodile! Fox’s younger brother Chase is made captain of the Davinal Under 11’s. With the brilliant Jimmy Rioli, a giant burping ruckman, and a highflying one-armed centre half back, they are set for a fantastic year. But one obstacle stands in their way: the completely incompetent Mr Percy has volunteered to be their coach! Midway through the season, Fox faces an unexpected test – he’s forced to team up with Mace after a slick Metro side challenges their local country league to a match. Can these longtime rivals put their differences aside long enough to triumph over the city slickers? All of your favourite characters from the first two seasons return, and the Diggers have a new recruit – a speedy half back flanker called Aslam Khan. Fox Swift and the Golden Boot tackles some serious issues including racial intolerance, bullying, cheating and bad sportsmanship but, with Cyril Rioli’s tips and drills, a wonderfully wacky storyline and witty illustrations, there is a lot of fun to be had along the way – making it the perfect book for any child with a passion for Aussie Rules, or just a passion for a good read. David Lawrence is a comedy writer whose TV credits include Talkin’ ’Bout Your Generation, TV Burp and Hamish & Andy. He runs the successful comedy business Laughing Matters, and has performed in five Melbourne International Comedy Festivals. Cyril Rioli has played more than 100 games and kicked more than 150 goals for the Hawthorn Football Club. He was a member of the Hawks’ premiership-winning teams in 2008—his debut year in the AFL—2013 and 2014. Jo Gill is a comedy writer/performer with TV and theatre experience. Her credits include Hey Hey It’s Saturday, Hamish & Andy, Comic Relief, Talkin’ ’Bout Your Generation, Comedy Inc. She was also head writer of the Logies for three years.